Despite soggy skies, the 13th Annual John May Mile & 5K raised more than $20,000 for the Greenport Fire Department Saturday — and honored Southold Town Police Chief Martin Flatley. According to Peconic Landing, 5K winners were named in the categories of Top Male Overall, which went to Chase Junell, 22, of Harper, TX, whose time was 16:29.6, and Top Female, which went to Claudine McShea, 40, of Greenport, whose time was 26:49.0. 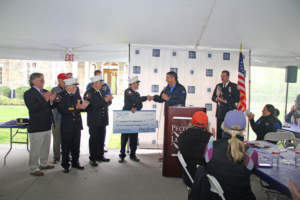 The total donation to the Greenport Fire Department was $20,715, Peconic Landing representatives said. Chief Flatley was honored with the Older Americans Champion Award.